This pendant was for my daughter-in-law’s birthday. Her birthstone colour is blue so I decided to use a blue topaz and 2 white topaz gemstones with sterling silver wire for the pendant. Again for my inspiration I turned to nature.I’m really finding that nature influences me a great deal in my jewellery creations. So this is my artistic view of blue and white flowers being clutched by a vine. 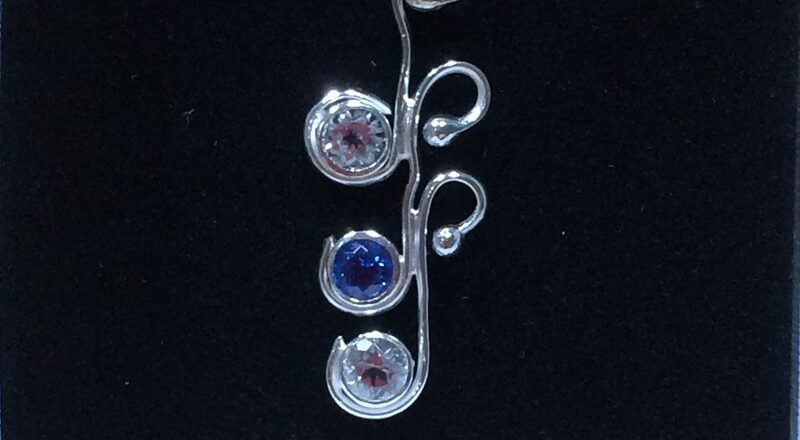 How I created this nature inspired pendant is first I cut 3 pieces of sterling sliver wire for the vine. Then I balled one end of each piece of wire to make it look more like a vine. To make the flowers I added 3 sterling silver tube settings to the other end of each wire by curling it around the settings so it gives the impression of the vine clutching the flowers. Once the tube settings were all attached I soldered them together. Once the setting was made and cleaned up I added these beautiful topaz gems. And so here is my artistic impression. Oh and by the way my daughter-in-law loved it.